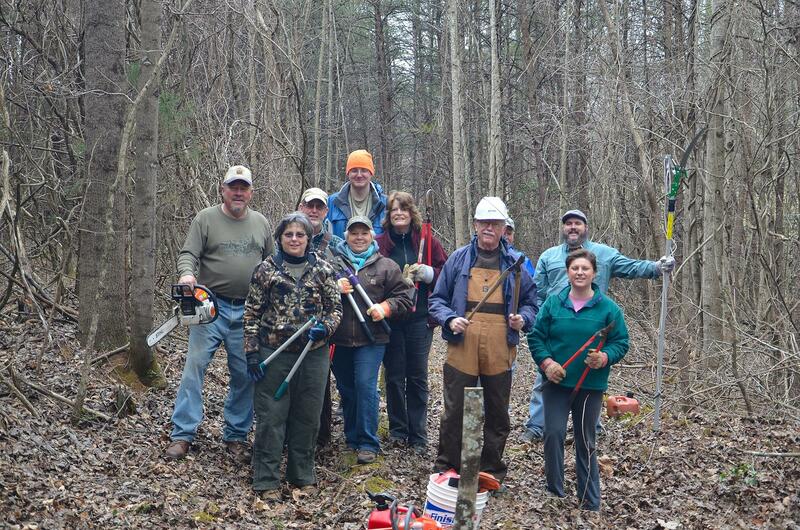 Come on out for our next trail workday on Saturday April 13th. We will be “rough cutting” about 1/2 mile of beautiful trail along two creeks. This section of trail will be “bike/hike” only. We meet at the tasting room at the Grassy Creek Winery at 9:00 AM. Please bring loppers, small saws, gloves etc. If you are experienced, bring your chain saw and weed eaters. Throw in a pair of wire cutters if you have them as there are remains of a wire fence that will need to be removed. Directions to Grassy Creek Winery: Take I-77N to exit # 83, Rt. 21 north. 1/4 mile AFTER the first light, turn left on Klondike Rd. Drive 1/4 mile and turn left on “Tasting Room Road”. Please park behind the tasting room building. Winery will be having a Barbeque. Please e-mail Bob Hillyer at bearc98@aol.com if you plan on attending. That way we can notify you if we have a weather delay. ← UPCOMING TRAIL WORKDAYS – JOIN US!